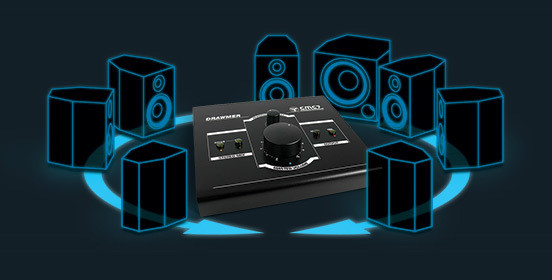 SURROUND CONTROL THAT'S COMPACT, ACCURATE & AFFORDABLE. The CMC7 is a compact 8 channel / 7.1 / 5.1 surround volume controller and cost-effective alternative to the more complex and feature rich MC7.1. 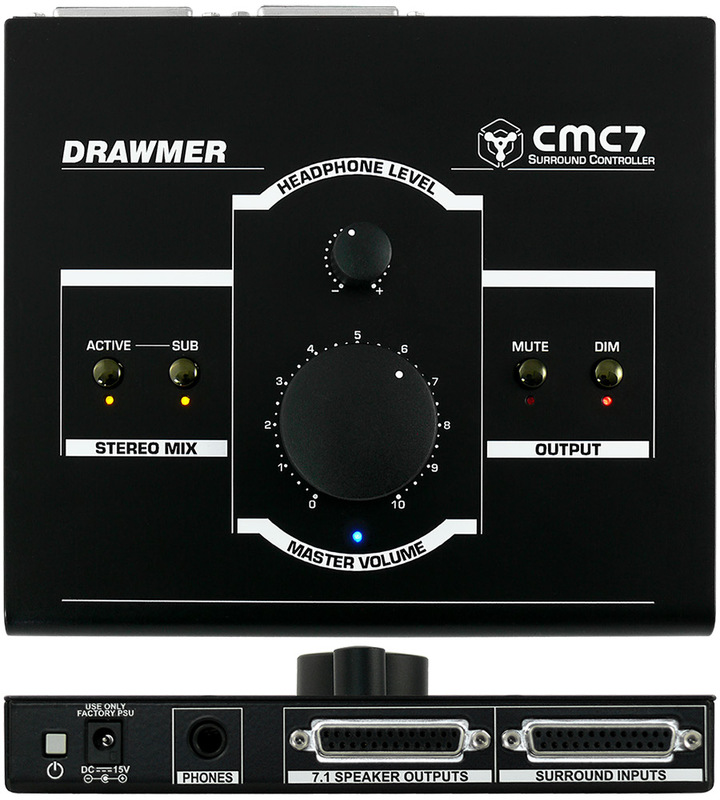 In order to maintain it's compact proportions and to keep the product budget friendly the CMC7 does away with controls that can often be found within your workstation software and concentrates on essential features such as ease of use and the quality of the signal path, ensuring that the audio is transparent and accurate across all channels and operation intuitive. Whether it is producing audio for film or television, or transporting the listener directly into the venue of an all-encompassing orchestral piece, one thing is sure, the number of users that wish to listen to audio within a surround setting has been growing and will continue to do so. There has been an ever-increasing number of surround products coming to market, not only blue ray players and home cinema but also on mobile and media devices. For example, Apple devices have been capable of reproducing 7.1 surround since iOS 9.3. Therefore, it is likely that at some point every artist and engineer will consider trying surround sound, or fear being left behind. The budget friendly CMC7 allows you to do this without the large financial outlay that other setups will produce. 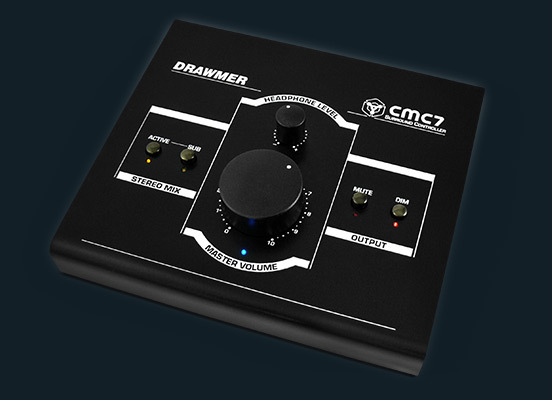 Coming from the same stable as the MC2.1, MC3.1 and MC7.1 you can be sure of the same high quality for the Drawmer CMC7 Surround Monitor Controller. The circuit is just as transparent and accurate. It's controls have the same quality feel and operation and the huge volume knob provides excellent channel matching, and smooth feel. You hear exactly what you've recorded! The 8 inputs and outputs are provided via two balanced 25 pin d-sub connectors wired to the Tascam standard making connecting easy. It allows for 8 independent channels, 5.1, 7.1, quadraphonic, DTS®, Dolby Digital EX,THX Surround EX™, DTS-HD™, Dolby Atmos®, etc, the setup is up to the user. With the Stereo Mix switch active the surround mix can be bounced down to a 2.1 signal in the front left and right monitors and sub-woofer, to test the quality of the recording when in stereo. In addition, it has a professional quality stereo headphone output with a separate amplifier and level control, that provides private mix checking, a DIM switch reduces output by 20dB and a MUTE switch is also available to cut the output completely. The circuit design of the CMC7 ensures that the channel matching of all 8 channels is consistent throughout the full range of the volume control. Other manufaturers of surround controllers use multi-ganged potentiometers to achieve the levels of the 8 channels, this is especially true of passive surround controllers, this simplifies the circuit but leads to discrepancies in the level of each channel, especially at the lower and upper volumes, where accurate channel matching can vary wildly. The CMC7 packs a lot of features into a small package. With a footprint of just 18x16cm and a very low profile the CMC7 won't hog your desk space like some other controllers do. And if your on the move it's small enough to pop into a bag to take anywhere. Whilst being smart and stylish the rugged, all steel enclosure will withstand the knocks and bumps of the studio, and, coupled with the high quality components used, the CMC7 is built to last. In addition, a Kensington security slot provides protection from thieves. Can you trust the audio that your current monitor controller is providing? Is it colouring the sound? For all Drawmer monitor controllers it is imperative that what you record is exactly what you hear. There is one thing that should always be absolutely guaranteed - that you can rely on the accuracy of your monitor controller. All 8 inputs and outputs are via 2 tascam standard 25 Pin D-Sub connectors making connection to interfaces and speakers simple and intuitive. Mix down switch enables you to check the Surround as a Stereo mix with an independent Sub switch controlling the LFE/Sub. Timed relay protection on all speaker outputs to prevent power up/down bangs. A large volume knob incorporating excellent channel matching and smooth feel. An independent Headphone Amplifier with Individual Level Control with jack on the rear. Kensington security slot (also called a K-Slot or Kensington lock). Very low profile desktop enclosure with a footprint of just 18x16cm. Stylish and Rugged Enclosure will withstand the knocks of the studio. All features and controls are subject to change.